Taking a cue from Apple’s unified iPad and iPhone UI, Android 4.1 has a tweaked user interface to more closely resemble the Android smartphone experience. This sould be a positive change if you’ve ever used an existing Android tablet or Android 4.0 Ice Cream Sandwich and found it to be a foreign experience, particularly for those who own Android phones. Google hasn’t announced an official release date, but pre-orders are possible now and the tablet is said to ship soon. Having no hands-on experience with the tablet, it’s hard to form much of an opinion on it, though I must say the 3/4lbs weight and the price point is very compelling especially when compared to other $199 tablets and even the iPod touch. 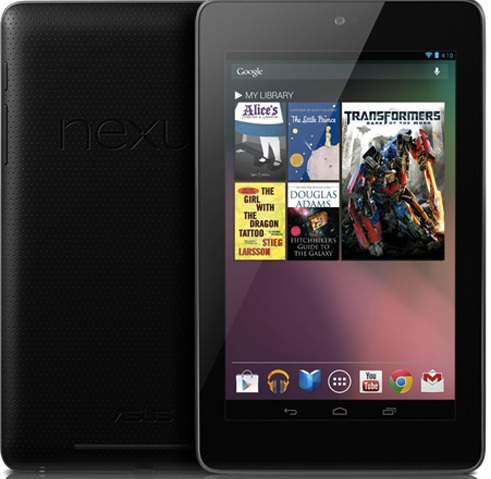 What do you think, will the Google Nexus 7 be a hit? Will it inspire Apple to release a 7″ tablet? iPad Mini to be Released by October? $200 is cheap, but will it feel slow and clunky like the Kindle Fire and Samsung Tab does? Why would I want to leave the iPad ecosystem? I would need a hands on to really know more, but for $200 if Apple had a 7″ iPad I would be sold. The hardware doesn’t mean anything if the OS is bad as the previous ones. Not to be apple fanboy, but the feeling using iOS differs greatly compared to Android, even WP7 offered better experience. Also, I’d like to point out that the hardware has no meaning in smaller devices, because they are small. Like the big fun – the PRO tablet from Microsoft.. The Google Tablet will compete with Kindle Fire only. The iOS users will be reluctant to leave the great eco-system (even if the Google’s get’s better), on other hand the M$ tablet has unknown price and availability date, which makes it out of the game for now. I think that at 7″ and $200 it doesn’t aim so much at iPad as it aims at Kindle Fire audience, and as much as I like the device I think that it will mis the mark. Kindle Fire is a very … cra… errr, suboptimal piece of hardware with an outdated OS (they forked Android somewhere around version 2.2), but it sells like crazy because a) it’s <$200, and b) because of Amazon Prime that comes along as a really good all-around content source. I don't see Google Play coming anywhere near Amazon prime in terms of offer, neither in books nor movies/music/tvshows arena. So I don't think that it will be a flop, but it will not drastically change the market neither. Kind of a weird move for Google to target their Android partners, but I agree with you it is aimed at that market. But the fact they called it Nexus 7 tells you a Nexus 10 is coming too with a bigger screen. It has 4 CPU cores and 14 GPU cores so its going to be blazing fast. Ipad 3 currently only has 2 CPU cores and 4 GPU cores to give you an idea. Nexus definitely has better hardware. The only thing Ipad over this tablet is the retina display and of course the app ecosystem (esp tablet optimized apps). For me the biggest deal is the tablet optimized apps. Right now android doesn’t have enough. But this might change if nexus 7 takes off. I am going to buy one for all of my family members. $200 just seems like a great deal. Personally I will continue to use Ipad b/c of the great apps it has. Hardware core count is not a good way to predict how “fast” (responsive really) a device will be. Windows Phone 7.5 devices are very responsive, and use a single core CPU, and no GPUs. iPhone 4S is running an 800 MHz dual core/dual GPU setup, yet still does fine, even in comparison to the Quad Core Android phones. In a similar way, the “new” iPad/iPad3 is not lacking in any way, even though it only has a dual core CPU/quad core GPU hardware complement. Current bench tests show the Nexus 7 is better than, or neck and nesk with all of the “high end” Android tablets (Acer A700/Asus Transformer Prime). It is a really good device for the money, and will do well in the marketplace, and deserves to. The 7″ form factor is a lot more useful when moving around. It isn’t as good for reading books, but most other things work well enough on a 7″ screen that the extra size/heft of a 10″ unit is hard to justify. I really hope that Apple does see fit to come out with a 7″ form factor iPad. Then I can get away from my Playbook. I would be very surprised if apple didn’t enter the 7” market. and I would also be surprised if google didn’t produce a 10” tablet in the future. It will be interesting to see if the rumored ipad mini will be priced at $199. That would be some serious competition which is always good for consumers. Welcome to the market Nexus 7 and good luck. The reality of it is competition is good in the marketplace. As an Apple fan and user I’m not to worried about this device coming in a killing the iPad or the ecosystem. As research has shown Apple is not worried about market share and it’s main concern is profitability. Apple understands everyone can’t afford or for that matter even likes their products and will produces only things that are relevant to it market. Other company’s will fill in the gap within the market with lower quality and lower priced products. In the scope of it all that works for everybody. Apple in my opinion won’t be rushing a 7″ tablet to the market anytime soon. It’s just like what they did with the netbook market……they created the MacBook Air and decimated that market. Now everyone else is releasing ultrabooks that looks like the Airs. The 7″ tablet has a place in the market and will have a customer base who loves it. A company other then Apple will own that segement of market and good for them. However, in the long run Apple will be the most profitable in the over all tablet market with its brand and user experience will keep people coming back to them. The MacBook Air most certainly didn’t “decimate” the netbook market. You don’t decimate a market for $200-$400 devices witha $1000-$1200 device. The real Apple product that killed the netbook market was the iPad. It was a little bit more expensive than a higher end netbook, but did more, had better battery life, was more portable, arguably more capable, and the touch interface. I don’t see why a 7″ Apple tablet wouldn’t be a good product. Apple could easily bring that product to market, adding in the typcial Apple design cues, the outstanding build quality, and incorporating it into the eco system will be done from day one if the 7″ tablet were to run a 1024 X768 resolution, like the iPad/iPad 2 do. All of the existing software should run on it, and as I posted before, it is much more portable than the 10 Ipads. Even if it costs more than the Nexus 7, I think there will be a pretty good market for a 7″ iPad. I have a fire and I would like the nexus. iPad still is the winner though. I don’t see 7″ tablet from Apple. If anything Jobs was clear about that. Also, what is the point having this small tablet? Like Samsung Note, Galaxy S3, Galaxy tab… they have similar sizes and that is not doing any favors to anyone (except the fanboys probably). It is kind of strange for me – the Android phones get bigger and the tablets kind of smaller in some way. Why is that?